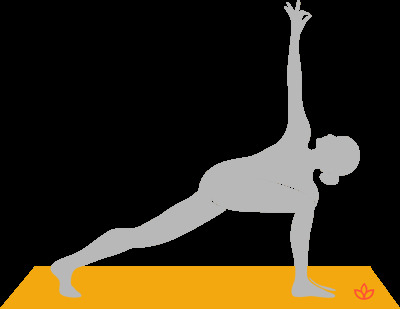 What is Revolved Side Angle Pose? Revolved side angle pose, or parivrtta parsvakonasana, is both a stretching and twisting posture. From a lunge, the torso is folded forward and twisted so that the bottom hand rests outside of the front foot, top arm reaching alongside the ear. It is similar to, but more intense than, revolved triangle pose. Start in a lunge with your right foot forward, back foot on the floor and at an outward angle. Exhale and rotate to the right, bringing your left hand to the floor outside of your right foot. Inhale and reach your right arm up and then alongside your ear. Avoid this pose if you have high or low blood pressure.